I'm sure that's something that your parents or grandparents said to you when you were little or even not-so-little. Don't forget where you came from. Remember the ones who came before, the trailblazers, those upon whose shoulders you stand. But it's not just a saying that you ignored over Thanksgiving dinner. I know that everyone is fired up for War of the Spark (WAR), and every leaked or previewed card is providing wonder and speculation that comes from the this-card-is-so-broken-we-should-ban-it-now. But remember your roots. Many times, cards that are broken in the future are in fact broken because of the presence of cards from the past that aren't played and no one remembers. After all, Saheeli Rai spent the first few months of her lifespan virtually unplayed... until Felidar Guardian came along.That was enough to break Standard for a time. So this month I want to look back to the sets that are going to be rotating this fall and give you an idea of the cards I wanted to play that just never found a home, or cards that seemed powerful but just need one last push to get there. Please note that this is NOT a speculation article. I'm not telling you to jam your college fund into buying a thousand copies of one of these cards. But these are the cards that are in the back of my head as preview season starts...the cards that could FINALLY find their way into a playable deck if they just got a little help. 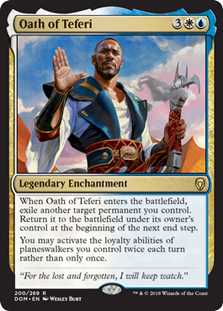 Oath of Teferi is the most obvious choice from past cards, and rather than going in chronological order I'm starting with this five-mana enchantment because of what we already know about WAR: that there's going to be one planeswalker in every pack. Beyond a few meme-y decks that were attempting to do the Superfriends thing and caused Oath to spike for about... two days... it's gone back into the bulk box just because most of our cheap planeswalkers don't do a lot. The thing about expensive enchantments is that you've got to get value out of it on the turn you play it. You can't go turn five Oath and pray that (a) you've got something in hand to play on the next turn, and (b) that you'll be able to do anything with it anyway. But War of the Spark means we're going to get new planeswalkers. A LOT of new planeswalkers. And, in theory, some of them are going to have to be CHEAP planeswalkers. The sort of 2-4 mana 'walkers that you can play on early turns and then have on board for Oath's arrival to do broken things with them. We also have the benefit of all the shocklands in Standard that makes the possibility of a three- or four-color deck more reasonable (and Chromatic Lantern if you really want to be nutty and do all five colors). Huatli, Warrior Poet and Huatli, Radiant Champion are my second and third picks to watch. Talk about a planeswalker that premiered in the Ixalan lore and then fell off the face of the earth... wow. Huatli even switched colors halfway through the story and STILL couldn't find play. But these are the first two current planeswalkers that I thought might get play if Oath of Teferi catches on. Huatli, Radiant Champion is getting a bit of play in some Selesnya Token builds since it's a bit cheaper and its plus ability is really strong if you have a board full of tokens. But that strength multiplies if you can play Huatli, use the plus ability to raise the loyalty through the roof, and immediately either use the minus to pump up the crew or ultimate and start drawing a bunch of cards. 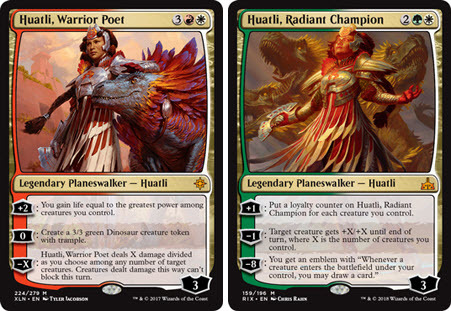 Huatli, Warrior Poet is less likely since most Boros decks don't want these abilities, but double activation of life gain plus a creature or the zero ability to put six power and toughness on the board across two bodies is a lot of protection for your 'walkers. I am a complete honk for alternate-win-condition cards like Liliana's Contract. I worked forever trying to make Hedron Alignment work, and the celebrations that ensued when the Hedrons finally Aligned were epic. I've even played Maze's End in Modern, which is fun but still fruitless (By the way, Wizards, Maze's End in War of the Spark or we riot, and no I don't care about the Vorthos flavor complaints. Just get this done). When I saw Liliana's Contract previewed, I knew immediately that I was eventually going to win a game with this card. But I haven't yet, strangely enough partly because of the flavor issue. Most attempts at a Contract deck have relied on Arcane Adaptation turning all of your creatures into Demons, and then winning that way. But that's not what the card FEELS like you're supposed to be doing. I want to play demons to win not a bunch of non-demons that rely on some blue enchantment to get it done. The problem, appropriately enough, is that demons are big and expensive. They're SUPPOSED to be big and expensive, sure. But if we get just one or maybe two smaller demons in WAR, watch out. We already have black ramp with Cabal Stronghold that can fire out some of the bigger demons on earlier turns, but we need something that plays in the early game. If you see a cheaper demon in War of the Spark, it's on. Storm the Vault is unlike many of the flip enchantments/artifacts from the XLN cycle in that it has not seen a lot of play. Search for Azcanta is a multi-format staple. Treasure Map is a filtering champion. Decks built around Hadana's Climb and even Primal Amulet have seen play. But poor Storm the Vault has gotten no love. 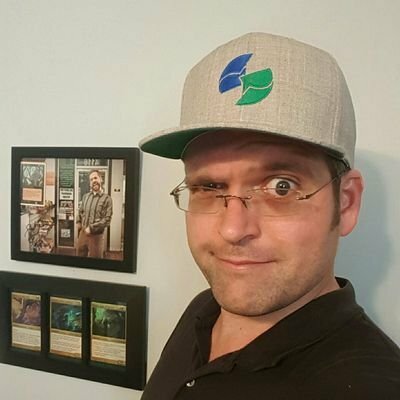 You would think that the possibility of getting a Tolarian Academy in Standard would be motivation, but alas it has not been so. Many of the possible treasure decks never came through and there wasn't enough of an artifact theme to make this happen. 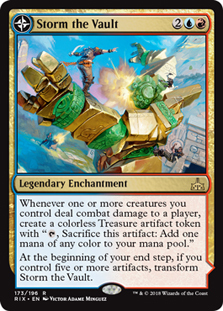 But there could always be a few new artifacts in WAR plus a new Tezzeret or another planeswalker, and we already have Karn, Scion of Urza. It's fallen off in recent months but can still make some big ol' artifacts with his minus ability, so I wouldn't forget about this one. I'm going to keep banging the Isareth the Awakener drum until I either get what I want or it breaks. There HAS to be a home for Isareth before she rotates. This card feels really strong to me. You get a reasonable body for three mana, she has deathtouch, and the ability to bring back creatures from the graveyard on every turn? FeelsGoodMan. I was playing Isareth as a creature in a mono-black Panharmonicon list in Standard for a while, and she did fine. But she's also what I call a "removal-magnet". Despite being not nearly the most powerful thing you can do in Standard, she not only dies to a lot of stuff but also your opponents want her dead immediately. She'll sometimes even draw removal when there are stronger targets to kill just because she's so scary. I think she'd need another mono-black build to really support her in the way she needs, because we've had some graveyard decks already in the meta and she STILL can't catch on. But a man can dream. The last card I'm keeping my eye on is Arvad the Cursed. Okay, this one's a REALLY big flyer but hear me out for a second. We know there are a LOT of planeswalkers in this set. And we KNOW that Bolas causes terrible things to happen wherever he goes. So what if some of these planeswalkers lose their spark and get printed as legendary creatures? If that happened I can't imagine they'd be terrible on their own, so here comes Arvad. 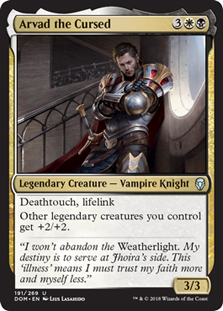 +2/+2 for legendary creatures is a ton of boost and a definite wincon, and we already have Orzhov decks that play Lyra Dawnbringer and Vona, Butcher of Magan that would benefit. I'm not sure that WAR will give this card what it needs to be successful when we already had a legendaries-matter set in DOM and it still didn't work out outside of Limited, but we'll see. So there it is -- this is what I'm going to be remembering when sorting through all of the WAR spoilers. Did I forget anything? What do you have in mind? Is there anything you're excited to try to build around one more time before rotation? Let me know, and maybe we'll find something fun and new together!